Dr. Hayes in his first book, An Arctic Boat Journey, demonstrated his abilities at gaining both scientific and financial support for his second Arctic expedition, search for the legendary Open Polar Sea. Of note, Chapter 34 “Concluding Remarks” and the following “Appendix” illustrate Hayes’ ambitious plan to return to the shores of Arctic Greenland. 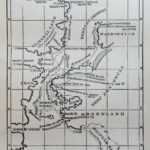 In Chapter 34, Hayes methodically sets forth his logistical issues and general vision for his second (1860) expedition well beyond “The North Water” to the time-shrouded Silurian cliffs of Ellesmere Island. Hayes, as well as the scientific community, believed that once so-called polar “barrier of ice” had been crossed, open water may exist. Borne out of the First and Second Grinnell search and rescue expeditions with Elisha Kent Kane, MD, Hayes developed a unique vision, if not a calling, for the exploration of the eastern High Arctic, especially Smith Sound and Kennedy Channel, the isolated and oft times ice-cluttered passageway between Ellesmere Island and Greenland. Like many who ventured north in search of the lost Franklin Expedition, Hayes made advances and discoveries of the Arctic regions that may have been otherwise delayed for decades or at least until the advent of steam-powered, iron-clad wooden schooners. 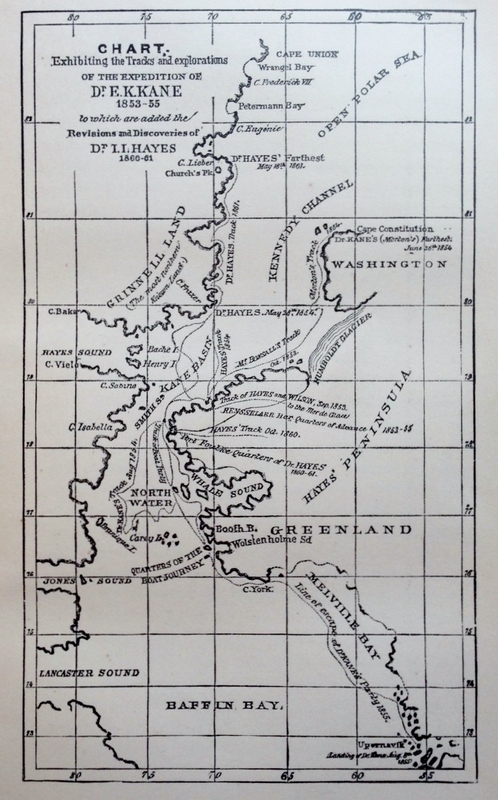 Franklin’s search for a navigable Northwest Passage may have influenced Hayes to conduct his own search for an open region of Arctic Ocean. Whether Hayes’ open ocean was a transient, summer polynya, his navigation vision nearly has been realized from present-day warming and subsequent opening of Arctic waters. The announcement of an open sea within the Arctic Ocean was made in those words by Dr. Kane after the return of his man [William] Morton from a sledge excursion in June, 1854. ‘It must have been an imposing sight, as he stood at this termination of his journey, looking out upon the great waste of waters before him. ‘Not a speck of ice,’ to use his own words, ‘could be seen.’ There, from a height of four hundred and eighty feet, which commanded a horizon of almost forty miles, his ears were gladdened by the novel music of dashing waters, and a surf, breaking in among the rocks at his feet, stayed his further progress. For the resolution adopted by the American Geographical and Statistical Society, I perceive that the expedition will probably leave in the spring of 1860, under the command of Dr. Hayes, its promoter, and that its expenses will be covered by means of a subscription. The attachment which I have always felt for Dr. Kane, and which he kindly shared, and the honor which your learned Society had done me by electing me an as their Honorary Member, leaves me ground to hope that they will allow me to place my name among the number of subscribers with a sum of five hundred francs, which I hold for their disposition. 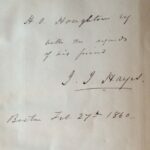 Inscription inside front cover “An Arctic Boat Journey” signed by Isaac I. Hayes, MD. Within the thirty pages of the “Appendix” of An Arctic Boat Journey, Hayes documented the scientific support for his next expedition. By design, his book was published during the early winter months of 1860. 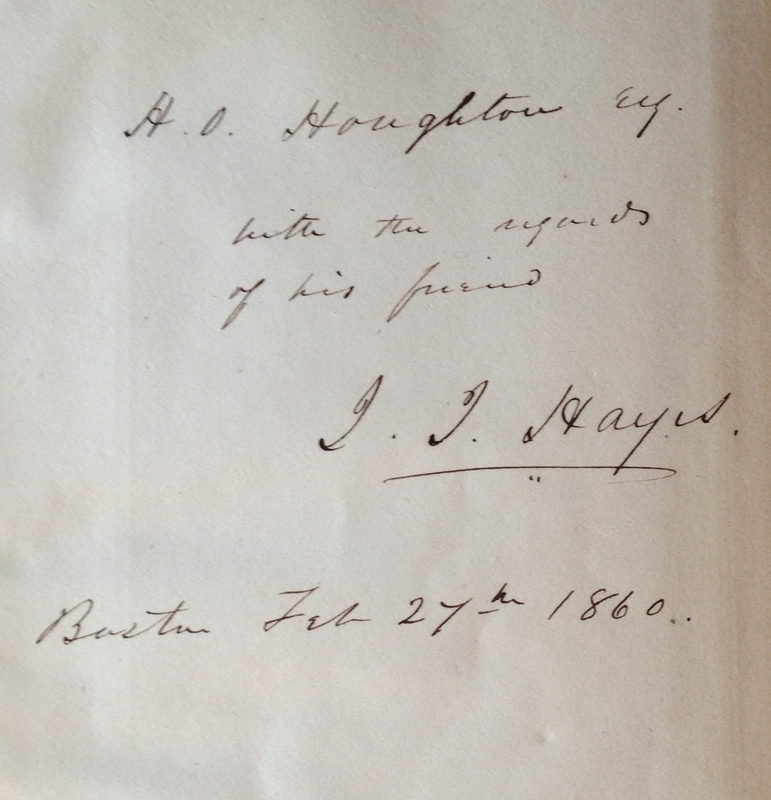 This tactical timing can be verified by Hayes’ marbled-covered presentation copy to his friend H. O. Houghton, dated, “Boston, Feb 27th, 1860.” Within five months, Hayes, the newly published Arctic book author, tripped anchor in Boston Harbor and led his own expedition along the Greenland coast.